I went to Utah last weekend for my Grandma's funeral. It was a very nice service. My mom gave a really good talk and it all went really well. I had the opportunity to be one of the pallbearers. They decided to have some of the older granddaughters do it along with the sons, sons-in-law and older grandsons. So my sister Cami and I were among the first group who carried the casket from the church to the hearse and another group carried it from the hearse to the gravesite. It was surprisingly heavy even though I'm sure Cami and I hardly did a thing. I think this picture is when I was having a REALLY hard time not laughing. I'm super immature and sometimes find it impossible not to laugh during really serious moments when it is totally inappropriate to laugh. Maybe one day I'll grow up. It was a short trip, but I'm glad I went. It was great to see so many family members and to celebrate my grandmother's life. 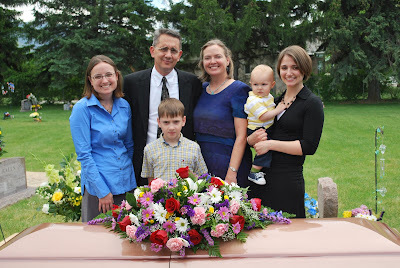 It was nice being a pallbearer, and I was also trying not to smile. Amy and I have the same giggling curse- remember when we couldn't stop laughing when you broke your arm? 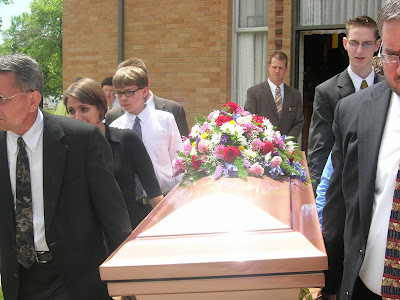 Cami: Glad to hear that I wasn't the only immature pallbearer. You bet. I think the broken arm was the worst one for me. I think I mostly laugh when I'm nervous now (well and when things are funny), which is often in those need-to-be-serious situations.